Eric Bartsch at CCG is working with Powering Imagination as their COO. Powering Imagination was founded by Erik Lindbergh, grandson of aviation pioneers Charles and Anne Morrow Lindbergh, to use advances in aviation to inspire sustainable solutions across the broader fields of Energy and Transportation. Powering Imagination has a portfolio of programs including: global aviation adventures, regional events & air shows, and media projects to spur innovation in sustainable energy and transportation. Eric Bartsch at CCG will be teaching another session of Open Innovation training in March 2014 in Chicago, IL. This 2 day course covers strategies and tools for integrating external resources with your internal innovation capabilities, to increase your capability to produce breakthrough new products. This course is being offered through Marcus Evans professional training. Formal marketing of the course will start in January 2014, and attendees wishing to pre-enroll can contact Eric at CCG directly. Eric Bartsch at Chanute Consulting Group recently completed a temporary executive leadership role with GreenWing International (GWI) / Yuneec to lead their manned electric aviation program in the US as it transformed from an R&D project into a refined aircraft design, ready to be displayed to the public. Eric had the privilege of working with and leading an outstanding team of aviation professionals around the world on this amazing project. These innovative planes went through substantial modifications and improvements during the middle of 2013 to be ready for their appearance at AirVenture 2013, the largest airshow in the world. 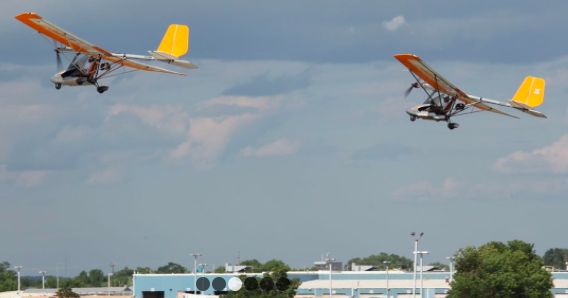 GWI’s eSpyder was the first electric aircraft in the world to be featured in a multi-plane formation demo team. The two planes at the show made a total of 12 flights in front of hundreds of thousands of spectators who saw the planes, but couldn’t hear them as they flew overhead silently. The development of the eSpyder is a major step forward in the development of electric flight and the future of the aerospace industry. GWI is the leading program in manned electric flight, and Plane & Pilot magazine’s November 2013 issue covers the revolutionary experience of flying one of these innovative, clean, quiet electric planes. Over the last 6 months, CCG has been working with Yuneec to form GreenWing International (GWI), a company dedicated to bringing Yuneec’s electric aviation projects to market. Acting as a temporary member of the executive team, and serving in roles spanning COO and GM responsibilities, Eric Bartsch of CCG has helped create the new business in this emerging and highly-innovative industry. The recent AirVenture show provided a platform to announce the formation of the new company and to launch its first product, the single-seat eSpyder, into the market. The customer and media interest in the program has been overwhelming and CCG is excited to have played a role in the formation of the electric aviation industry. There has been a lot of recent discussion on the role Innovation plays in the future health of the US economy. Creating jobs requires us to create whole new industries and new types of jobs. Historically this has been what has propelled the US economy and middle class and we urgentlyneed new types of high paying jobs that deliver new types of value. Eric Bartsch, President of Chanute Consulting Group, will be teaching a 2-day course on Managing and Optimizing Your Open Innovation Portfolio for Marcus Evans Professional Training. The course is offered May 29th & 30th in Chicago IL. CCG is proud to be working with Yuneec, one of the pioneers in electric aviation, to bring electric powered flight to market. CCG will be working with Yuneec to help lead the transformation of its electric flight program as it’s five year research program now becomes a global business pioneering the sale of clean, affordable, quiet electric aircraft. Yuneec recently received the world’s first certification for an electric powered manned aircraft, the eSpyder, from the German DULV in February 2013. Visitors to the Aero Friedrichshafen show in April 2013 were able to see the latest version of the eSpyder along with the progress on the larger 2-seat E430 electric aircraft. A good Strategy is critical to creating a successful business. Likewise, Innovation plays a key role in the long term success of most profitable businesses. However, neither Strategy or Innovation are an end in themselves. Both are methods for achieving something far more important: Meaningful Differentiation. Meaningful Differentiation occurs when customers see a worthwhile difference between your products/services/brands and those of your competitors. This differentiation can occur through a strategy that creates a new value proposition for your customers. It can also occur if you create innovative products that deliver more value to your targeted customers than your competitor’s products. Often the best companies use a combination of Strategy and Innovation to Meaningfully Differentiate themselves. We see many examples where Meaningful Differentiation results in long-term sustainable profitable results. Southwest Airlines is a great example. Southwest follows a different strategy than its competitors by flying one type of plane, avoiding hub and spoke operations, minimizing add-on fees, and focusing on efficiency. They also encourage innovative ideas from their employees to perpetuate their strategic advantages in cost and customer service. The result is an airline that over the long term has been more profitable than all of their US competitors combined. The reason for this outstanding performance is that they have used Strategy and Innovation to achieve Meaningful Differentiation in the eyes of their customers. Apple is another great example of Meaningful Differentiation. Their strategy of creating a closed system of hardware and software (OS) is different than their competition. Their product innovations with design, new product categories, and more useable user interfaces; have all further differentiated Apple from its competitors. The combined result of their Strategy and Innovation is Meaningful Differentiation, and it has driven outstanding results. In each of these examples, the past performance of Apple and Southwest are no guarantee that they will continue to be Meaningfully Differentiated in the future. However, clearly both companies have demonstrated the ability to achieve this goal for a sustained period of time, despite being in very competitive markets with numerous commoditized competitors surrounding them. Often we hear debates on whether a company truly has a good Strategy or whether their products are really Innovative. The real litmus test for both, is whether it can be said that the company has achieved Meaningful Differentiation. If the goal is achieved, then long term profitability will follow. Debating whether their Innovations are “breakthrough enough” or if their strategy has a unique enough value proposition is missing the point. If the end result is a clear Meaningful Differentiation in the eyes of the customer, then the important goal has ben achieved. If on the other hand, the company and its products are commoditized (like the major US airlines or the majority of computer manufacturers) then it is irrelevant how “breakthrough” their Innovations seemed or how unique their Strategy appeared. Focusing on Strategy and Innovation is important for business leaders. However, we must all remember that neither of these is an end in itself. As we refine strategies and strive for innovative products, we must always measure the results on a scale that ranges from Commoditization up to Meaningful Differentiation. Those who differentiate meaningfully will survive. Those who do not, will find themselves in a dangerous place. Meaningful Differentiation is the goal. Strategy and Innovation create a path to reach the goal. Eric Bartsch at Chanute Consulting Group will be teaching a course for Marcus Evans Professional Training on: “Leading and Implementing Customer -Focused Innovation” during March 7th and 8th 2013 in Chicago IL. emilyj@marcusevansch.com, 312 540 3000 ext. 6714. The mantra that “there is no such thing as a bad idea” can itself be a bad idea if mis-applied. As someone who has had their share of “bad” ideas, I have no doubt that they definitely do exist. How to deal with them in the context of a brainstorming session is a different story. I have found that with the right group and the right ground rules, it can be very useful to allow criticism of ideas after there has been an open sharing of different concepts. Ideas are cheap and many of them aren’t brilliant in the form in which they are first proposed. Often the true innovation comes from examining what makes a bad idea bad, and then figuring out if there is a way to develop upon it so that it becomes feasible and good. Those are the really valuable ideas. A couple of people have commented correctly that the facilitator needs to stay away from biasing the results by passing judgment. This is true and it can become dangerous for the facilitator to start steering the discussion. However, I have found that doing an unbiased critique of ALL of the ideas that have been put on the table, can unearth potential fatal flaws. The solutions to these possible fatal flaws are often the actual gems that come out of the brainstorming session, not the ideas as they were first presented. I prefer to stray away from the mantra that “all ideas are good ideas” because we all know that isn’t really true, and it can sound silly to many of the participants. Instead, it can be more useful to reinforce that even “bad” ideas are welcome and are useful to help us get to a good idea. It can even be interesting to specifically solicit bad ideas from the group, to see if there are any directions that are thought to be crazy, but might have merit if they can be refined or modified by others in the group. Suspending all judgment can be good for the initial flood of ideas, but a little judgment applied later in the session can do wonders for eliciting some really innovative ideas that make the results of the brainstorming far more actionable and useful.